I took my two oldest kids to a local fair one summer day long ago. We rode a few rides and enjoyed an elephant ear for the first time. 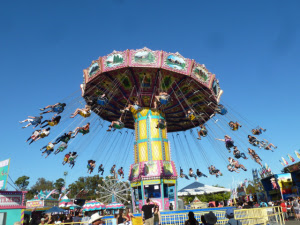 Later that same week, my ex-husband did the same fair with the kids, except this time, someone on the ride pictured above got sick and baptized my 4 year old daughter as she walked by, causing her to get sick herself. To this day, she can’t see a ride like this without feeling both a little queasy and a lot annoyed. I, selfishly, was always a little tickled that this happened on his watch, not mine. Bad mom. I know. Being with him was wrong. But the excitement and the anticipation made it all feel right. Listen to your head. Don’t be a fool. Ignoring all the warnings, Rachel made her choice. Lengthy absences only made her long for him more. The feeling of being slightly off-balance in his arms left her dizzy and breathless, like a carnival ride from long ago. Flying, butterflies in her stomach, unsettling, unsure. She wanted more. He gave her just enough. When he stopped contact, her world lurched to a halt. She lost the thread, dangling in midair like an empty ride at the fair. Oh I think I remember how that felt. Sorry, I meant to add ‘lovely story’. Thank you, Sandra! Hope you are well! Love is like that.. isn’t it.. the feeling is great.. like a true merry go round. Indeed- lots of opportunities for ups and downs. “An empty ride at the fair” – that is a great comparison to being lovesick. Thanks, I liked the imagery. Oh, yuck! In a good way. Great memory in this. Living your life through someone else is a dangerous tactic. Definitely not a good plan. Thank you for reading! Was that love or a drug? 🙂 Best that she got over it. Nicely done. Definitely love. – the wrong kind of love! He gave her just enough – a chilling line! Good story – great images. Oh that horrible pain of not knowing what happened to a love that seemed perfect… ugh. Really moving story, Erin. And love the ditty about your kids and the fair! Not sure if you got my email a while back… but still hoping to connect. Thanks, Dawn! I did – and will send out a note to connect the 3 of us! It would be fun to get together. That last line is a punch in the gut. You’ve put just the right words to a most desolate feeling. Well done. I remember a teenage infatuation that was like a carnival ride. Thrilling at times and scary at others. Glad I got off when I did. Great metaphor. Not bad, just a mom who loves a good story. I can relate.